I read The Maze Runner a few months ago when I heard that this movie was coming out. I enjoyed it, but I wasn't in love with it. The adaptation, however, was really good! The premise is this: A young man wakes up in an elevator, not remembering who he is or how he got in the situation. When the elevator stops, it opens into a large glade, which is populated by a group of other young men. 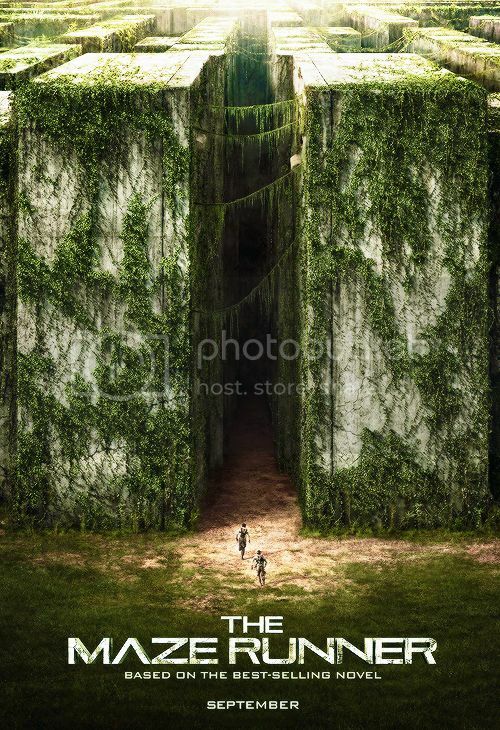 The glade, it turns out, is in the middle of a gigantic maze, and it's up to the boys (or so they think) to find their way out. They thrive on routine and the rules of the Glade. But soon, circumstances change, and all routine is thrown out the window. I haven't read the second or third book in the series, but a movie sequel has already been greenlit, so I suppose I'll need to move those up on the TBR* list. Regardless of if you've read the book, if you're a fan of thrillers or dystopian YA adaptations, I think you'll enjoy this film. I wanted so hard to love the first book and I really didn't. I certainly didn't hate it, but I wasn't in love it with like I was hoping. I definitely want to see the movie just to see what they do with it, but I'll be waiting until I can rent it on Netflix! I have yet to read The Maze Runner. I've kind of been avoiding it, even though dystopian fiction is one of my favorite genres. This may be one of the few times I watch a movie before reading the source material. I thought it was interesting, but it didn't make me want to live in the series like others have, if that makes any sense? It's not something I think you should drop everything for. It was entertaining, but by no means did I want to gush about it to everyone who'd listen. Even though it's a YA, it seemed written for a younger audience? Completely makes sense. As in, even though the Hunger Games world is kind of awful, I was still so into it that I wanted to be there.